How many times do you meet your revenue goal one month and miss it the next? Or you double or triple the goal one month and then just barely hit it the next? And this cycle repeats. At the very least, this inconsistency is dispiriting and at worst it puts your company on a downward spiral. When you can’t consistently meet your goals, the risk increases that you’ll experience more than one month in a row that falls short, bringing down the entire year. 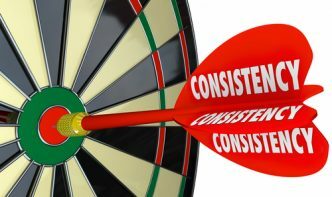 There’s ONE key behavior that protects you: consistency. Doing the same RIGHT things day after day and month after month. Even if you have a down month, by doing the same right things consistently you’re assured that momentum will build and move revenue upward. Make a powerful mental note of what consistency is: It’s when you implement your company’s best practices day in and day out, when things are going well and when they’re disappointing you. You don’t panic, you don’t celebrate and slack off, and you don’t give up. What gets in the way of consistency? Consistency should be easy, but like much of life, we are subject to interferences. I see, again and again, that three things get in the way of consistency. Which one or ones affect you? 1. Carelessness and its associates laziness, indifference, forgetfulness. Many owners and executives talk about doing the RIGHT things, and even spend money identifying what they are and creating processes and procedures for them. And yet too often it’s lip service: talking a great game without any true passion or commitment behind it. I see owners and execs hand off responsibility to others without establishing metrics and benchmarks to track performance. Without tracking, they fade away or collect dust on the metaphoric shelf. 2. Excuses!!!! No time, no money, we don’t do it that way. If I could eliminate just one of the things that gets in the way of consistency I would eliminate excuses. Excuses such as “no time,” “no money” and “we don’t do it that way” are made up to cover for discomfort at best and fear at worst. The owner or executive doesn’t have to face the mess or confusion of their weekly schedule and their failure to prioritize, focus and learn to say “no.” The more an owner makes excuses, the less likely anyone is to implement anything consistently. Remember, consistency is doing the right things every day no matter what. 3. Tangents disguised as opportunities–also known as shiny objects, results that are too good to be true, the next big thing, falling under the spell of magical thinking. The allure of tangents is that they’re exciting and grab your imagination! They are full of “WOW!” and promise. But they are not on your path, not part of the same right things that you do day after day and month after month. Their promised results are debatable. They often drag resources away from the right work. When you realize you have to discard the tangent, you also realize that you created a gap in doing the RIGHT things that can’t be recovered. More business, more revenue, more profit, more wealth: identify the RIGHT activities that will lead to these results, create plans, and implement them consistently. Before you know it, you will be seeing the results you planned for. Consistency—a steady walk towards results–beats the occasional sprint/stop/sprint sequence every month and every year. Is It Time for a Listening Call?